Lowdown: A Superman 2 reboot. The prevailing question with any new Superman movie, let alone Man of Steel, is – do we really need it? After all, it’s not like Superman Returns was such a success. In effect Man of Steel acknowledges that by restarting the whole Superman story again and attempting to prove its virtues through bleeding edge special effects and a long line of famous actors. Except, it has to be said, for the actor in the role of Superman himself – Henry Cavill. And so we are taken again to through the story of Superman’s birth, starring his father Russell Crowe. Crowe does a decent job stepping into the shoes of Marlon Brando; his is a more lengthy role, though. Then we’re back to earth to see the story of a young adult Superman told to us through a series of flashbacks. We meet his earthly parents, Diane Lane and Kevin Costner, and we meet that investigative journalist who’s always at the thick of Superman things, Lois Lane (Amy Adams). Then the challengers come in the shape of old baddies from Superman’s home world, who wish to recreate that world on this earth of ours. Not if Superman can help it; he may not be a human, but he sure is a humanist, raised as he was on the virtues of sacrifice and doing what’s right by the now too old to be dancing with wolves Costner. Fighting ensues, with our Superman facing numerous adversaries of similar abilities and much ruthlessness whose only fault is their lack of earthly prowess; would that be enough to overcome them? Give or take a few cities wiped off the earth and stupendous amounts of damage to lives and property, one cannot be taken by surprise through Man of Steel’s happy ending (an ending that leaves a definite hint of sequels, I must add). But yeah, we’ve seen it all before in Superman 2, minus the contemporary special effects. 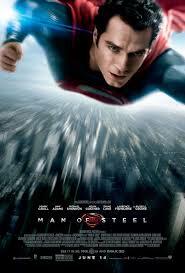 If Man of Steel is to stand above its peers then its through its special effects. When superheroes fight here they don’t just throw punches; they’re chucked through buildings and dig holes in the ground as they smash. It’s all very flashy, but at the end when director’s Zack Snyder (Sucker Punch, Watchmen, 300) flashed through the credits I sort of realised the type of vision I have just seen. And yes, it was pretty cool, and yes, I did enjoy it; I’ve enjoyed it much more than I do your regular superhero movie. But still: Do this director’s vision and this cast of A list stars justify another Superman? Or rather, wouldn’t the world be a better place if the same people were to engage in a brand new, original effort instead? I think it would. A significant message Man of Steel is trying to push on us viewers is to do with the need of the powerful to restrain the exercise of their powers. Superman learns this the hard way when a flashback has his Costner father die in front of his eyes. Superman could have easily saved him, but Costner asks for restraint. I would say that was a very not so subtle hint towards the attitudes of the filmmakers' USA. Overall: Superhero movies rarely come as good and grandiose as this, but still – there is nothing to Man of Steel we haven’t seen before. 3.5 out of 5 stars.